First, a brief diversion to Dallas. The Dallas Observer's Jim Schutze doesn't mince words. In Dallas, government-subsidized housing was always where the divvy was cut between black accommodationist southern Dallas and the old white money north. The white money was always delighted to see subsidized housing stay south, far from whitey-white land. Southern Dallas looked at public housing money as something to grab because it was the only money southern Dallas was ever going to see. Now, back to Richardson. Here's the map from Opportunity Atlas for Richardson. The city is outlined in the upper left. I cropped it to include areas south of the city, most of which are in the Richardson school district, to make a point. Note well that the map doesn't show the concentration of poor children today. It shows what's happened to poor children who lived in neighborhoods 30 years ago. Blue indicates they've grown up to escape poverty, no matter where they may live today. Blue indicates opportunity zones. Red indicates they haven't. Red indicates poverty traps. 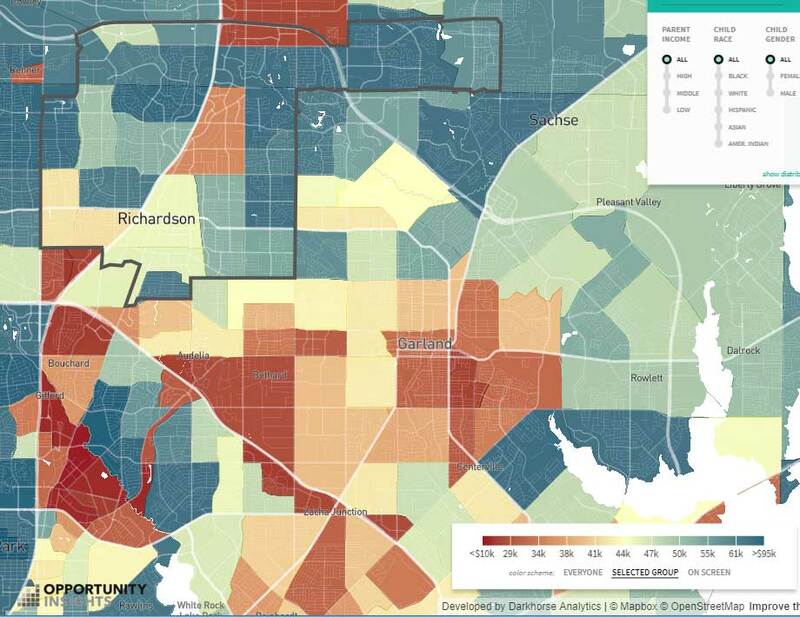 The City of Richardson as a whole looks like an opportunity zone. Poor children growing up in many parts of Richardson often escape poverty. It's not perfect. It's not uniform. But outcomes here are better than in neighborhoods to our south in Dallas, or to our north in old Plano, or to our east in old Garland. Trade-off up-zoning for more low-income housing. The City of Richardson is in the habit of changing zoning to accommodate developers who want to add density — taller buildings, more apartments, etc. The city expects to get something in return in the form of higher taxes later, but it's still more or less a giveaway now. The city ought to trade that benefit for a commitment by developers to include low-income housing as a percentage of the granted additional development. Win-win. The developer gets his up-zoning. The city gets more housing for its residents who most need it. More units that accept housing vouchers. 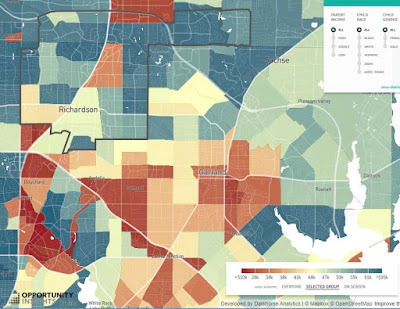 If the "Opportunity Atlas" is right, building more apartments in poor neighborhoods won't end the poverty trap. While "fixing" those neighborhoods is a long-term need, in the meantime we need to find a way to move poor families out of poverty traps and into the neighborhoods that have a proven history of offering an escape. Housing vouchers that families can use in those leafy neighborhoods with good schools and job opportunities is a way to do that. Seattle is supplementing federal housing vouchers with extra rent money. That's great, but at least Richardson should be seeking to overcome landlord reluctance and neighborhood resistance, and eliminate some of the red tape and state laws that make it inconvenient (or impossible) for landlords to accept housing vouchers. Now you know what I want for Christmas. So much better than another sweater.